Garden Sign For Sale: "This Garden Harvests Water!" Whether it's with our roving educational display or via a more formal presentation, look for us out and about in the Marin Municipal Water District service area as we provide a variety of opportunities to learn more about rainwater harvesting. See below to find out where we'll be next, and come say 'hello'. 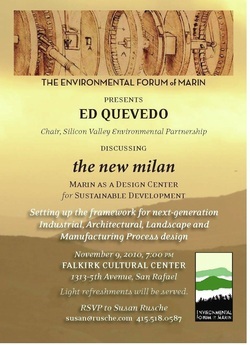 The Environmental Forum of Marin presents Ed Quevedo, Chair, Silicon Valley Environmental Partnership discussing the potential to set up the framework for next-generation Industrial, Architectural, Landscape and Manufacturing Process design. Stop by any time and learn how rainwater harvesting, efficient irrigation, plant selection and soil amendments and mulch can improve the health of the landscape and save money on water bills. Demonstrations and presentations by expert speakers from the Urban Farmer Store, Marin Master Gardeners, Marin Municipal Water District and SPAWN's 10,000 Rain Gardens Project. Presented by Sustainable Fairfax and Permaculture Marin. For more information on this summer series, visit SustainableFairfax.org or PermacultureMarin.org. Two informative films and speakers on the subject of water and sustainable water use: Sea to Summit and A Simple Question. Speakers: Paola Bouley of SPAWN and the 10,000 Rain Gardens Project, and Kathleen Lanphier and Rachel deMicco of Sustainable Fairfax. A celebration of the opening of this new store. The Whole Foods Country Faire will also feature a group of local non-profit organizations hosting fun and games for the whole family. The 10,000 Rain Gardens Project/SPAWN was one of the lucky groups and we'll be there with our display. Recipient of the Right Livelihood Award for her work on global water justice, Maude Barlow is considered by many to be one of the world's leading experts on water issues. "This notion that we'll have water forever is wrong. California is running out. It's got some twenty-some years of water." Barlow talks about how our misuse of water ay actually be changing the hydrological cycle and contributing to global warming. Alan Snitow was the news director for eight years at the Bay Area's Pacifica Radio station, KPFA-FM, winning the Corporation for Public Broadcasting Gold Award for Best Local Newscast. His films include the award-winning Thirst and he co-authored a book by the same title. We'll be setting up our fun, informative display all about rainwater harvesting and rain gardens in every town of the MMWD Service Area through the end of 2010. We hope you'll come meet us, ask questions and get inspired to begin rainwater harvesting at your home or business. Volunteers always welcome! Sign up via email at Rainwater@tirn.net.